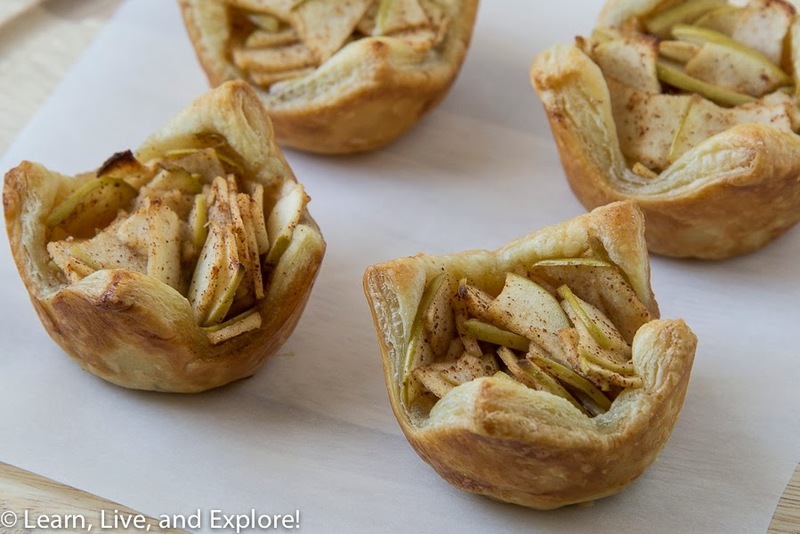 Baked Apple Cups ~ Learn, Live, and Explore! OK, I couldn't help myself. I did one more apple baking project this fall season! This is a recipe that is perfect for people who are not bakers and who love the taste of an apple turnover. Except for putting the pan in the oven, there really are no actual baking techniques involved. And, there's hardly any prep at all! 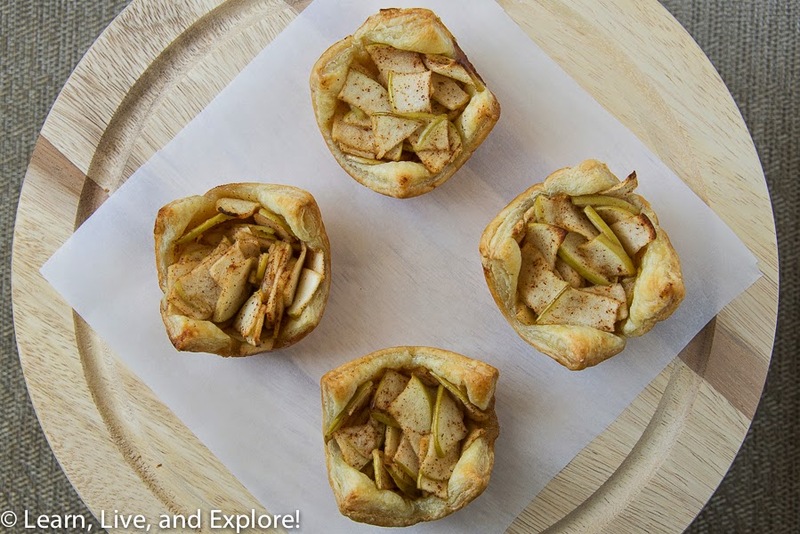 These baked apple cups, adapted from the Foodiecrush blog, are a perfect dessert to preview the delicious pie I know you're going to make for Thanksgiving dinner. The portion is just right to complement a hearty fall meal as well. The recipe below uses the whole box of puff pastry sheets, but you can certainly halve it to make less cups. Enjoy! Thaw the puff pastry dough. Spray two cupcake pans generously with vegetable oil cooking spray. Unroll and cut each puff pastry sheet into 9 equal rectangles, brush with melted butter and sprinkle with a small amount of granulated sugar. Place each puff pastry piece into a spot in the cupcake pans, gently pressing the dough evenly to the bottom to create your cup shape. Cut the apples into wedges, then using a mandolin (it's much easier and faster, trust me! ), thinly slice the apples with skins left on. Cut the thin apple slices into quarters so that they fit easily in the cupcake pan. Combine the apples, cinnamon, nutmeg, lemon juice, and lemon zest in a bowl and toss. Divide the apples evenly in the prepared dough cups. Bake for 17 minutes, check for any burning of the puff pastry, then put back in the oven for 2 minute intervals until the puff pastry is golden brown. While the cups are baking, line a cookie sheet with parchment paper. Using a fork, carefully lift out each baked apple cup and place to cool on the parchment sheet. The juices from the sugared apples are going to be scalding hot right out of the oven, but we want to get them out because if there is any juice that leaked during baking, we don't want the dough to sit in it while cooling. Serve with optional vanilla ice cream.